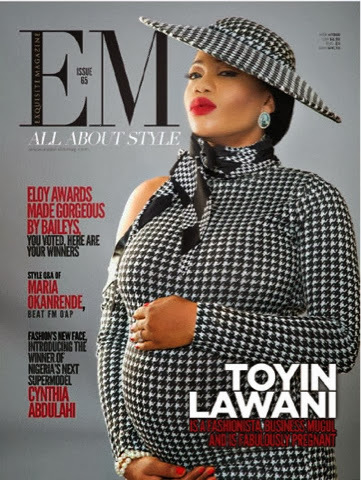 Fashion designer, stylist, entrepreneur and business mogul Toyin Lawani, Creative Director and CEO of Tiannah’s Place Empire showed that being stylish is not dependent on your body shape or size, as she stylishly rocked her baby bump on the cover of Exquisite Magazine. Toyin Lawani is the experienced Fashion Stylist, Entrepreneur and Business Mogul that runs Elegante by TiannahStyling which was officially launched on the 1st of March 2012. Since its launch, Ms Lawani has been stylist and designer to a number of celebrities within Nigeria including Wizkid, Banky W, Tiwa Savage, Don Jazzy, Juliet Ibrahim, Waje, Stephanie Okereke Linus, Toke Makinwa, and Yvonne Nelson. Internationally, she has designed outfits for Hollywood celebrities including Kelly Rowland, Bria Myles, Jennifer Richardson, and Natalie Nunn and has showcased in a number of shows including Africa Fashion Week London 2012, Africa Fashion Week Los Angeles 2012, Nigerian Entertainment Awards, Music Meets Runway 2012 and the Africa Fashion Week London 2013. Ms Lawani who holds a Bachelors degree in English Language from the University of Lagos, has gone on to start up a kids line- EleganteKidz with her daughter Tiannah as the face of the line and gave birth to her second child, a son on the first of January 2014.